Durga (a form of Shakti) is also known as Maa or Mother of the Universe. She was created when a demon King named Mahisasura was terrorising the Earth and heaven. The Gods went to trinity (Brahma, Vishu and Mahesh) for help. The Tridev then merged their powers and created a gorgeous female named Durga. She went to kill Mahisasura and on the ninth day of the fight, she stabbed him with her trident. After this, she was named Mahisasura-mardini (annihilation of the demon). There are innumerable temples across the nation, dedicated to Goddess Durga; many of these are situated on the top of hills and are quite popular among devotees. These temples are flocked by people throughout the year, especially during the nine divine days of Navratri. Take a look at these 10 famous Durga temples that are situated on the hilltop. The Vaishno Devi Temple located in the state of Jammu and Kashmir is considered so miraculous that people flock here from all across India. Dedicated to Goddess Durga, the temple is a huge pilgrimage centre and visited by lakhs of devotees every year. The world famous and most religious pilgrimage destination in India, Vaishno Devi Mandir is located at the height of 5300 ft on in the trikuta hills of state Jammu and Kashmir. 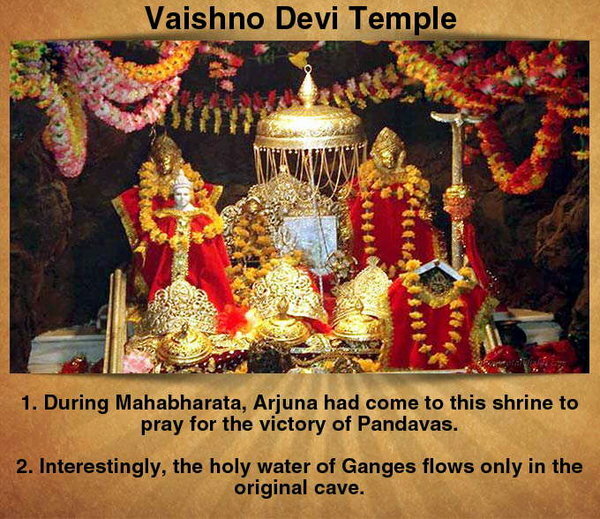 The holy shrine of Mata Vaishno Devi is located inside a cave in a hill, It is one of the most sacred Hindu pilgrimage site, Approximately 8 million yatris visit the temple every year. There is another famous hill temple known as Mata Balaji Sundri Temple in kathua, Jammu and Kashmir. This is one of the famous Hindu temples of India situated in Satna district of Madhya Pradesh. Maihar wali Mata Temple is situated on a trikuta hill of maihar in the state called heart of India. 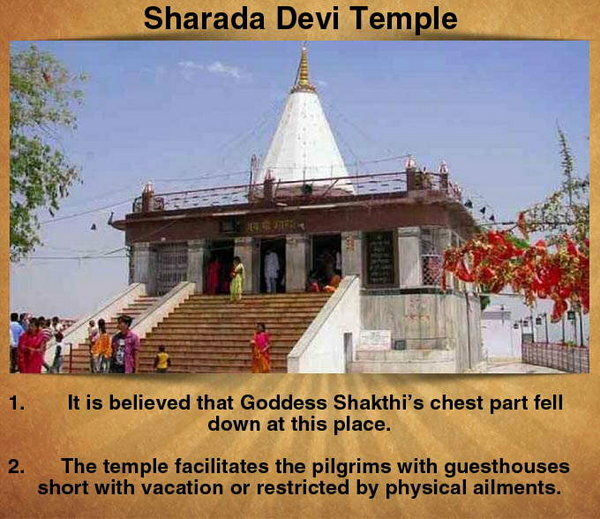 The sacred and holy temple is one of the 51 Shakti Peeth of goddess Parvati,where the necklace of Sati fell. The temple is well known for the 1063 steps to the top, Millions of devotees throng the temple all round the year. Other most famous Durga temples in Madhya Pradesh are Ratangarh Wali Mata, Tulja Bhavani Devas and Salkanpur. Dedicated to Goddess Manasa Devi, the temple is in Haridwar, Uttarakhand located atop the Bilwa Mountain. 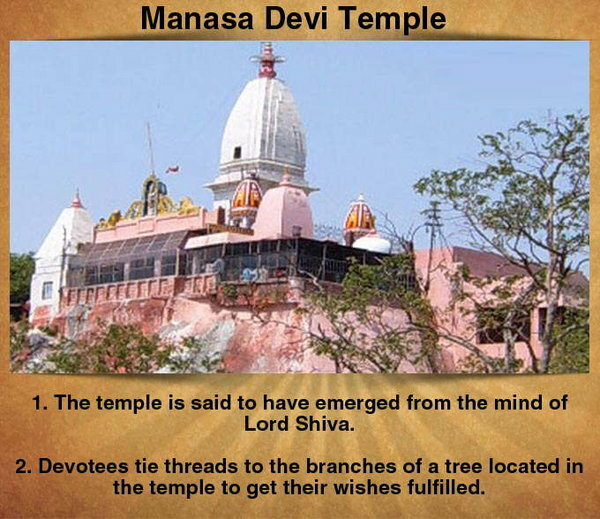 Mansa Devi is one of the most visited and most popular temple, dedicated to goddes- s Mansa in the holy city of Haridwar, in the Uttarakhand state. The temple is located at top of Bilwa Parvat on the Sivalik Hills, a mountain chain of the Himalayas. The Shakti Peeth is one of the famous siddh peethas along with other two Peethas are Chandi Devi Temple and Maya Devi Temple located in Haridwar. The Chamundeshwari Temple is situated on the top of Chamundi Hills, about 13 km from the palace city of Mysore in Karnataka. The temple was named after the fierce form of Durga, Shakti by Mysore Maharajas. 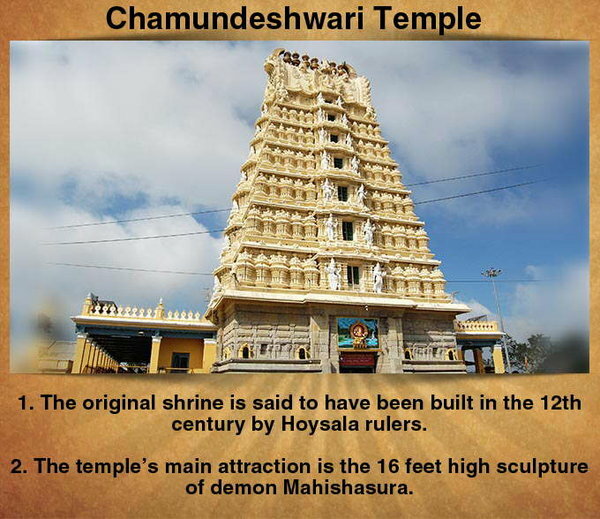 The Chamundeshwari Temple is situated on the heights of Chamundi Hills at Mysore in the state of Karnataka. The Chamundedshwari Temple is considered to be a very religious temple having large silver gates and golden idols. Chamundi Hills is one of the best tourist attractions in Mysore, Other religious tourist attractions are Devarayanadurga, Hidimbeshwara Temple and Ekanatha Temple. Tara Devi Temple, located in Shimla is a very famous tourist attraction of this place. Situated at a distance of around 11 kilometers from Shimla, this famous temple can be visited while traveling on the Kalka – Shimla National Highway. The Tara Devi Temple is situated at the top of a hill called the Tara Devi Mountain in Simla, Himachal Pradesh. It is one of the famous temple and most popular tourist attraction of the city,surrounded by lush green devdar trees, green forests and green meadow. 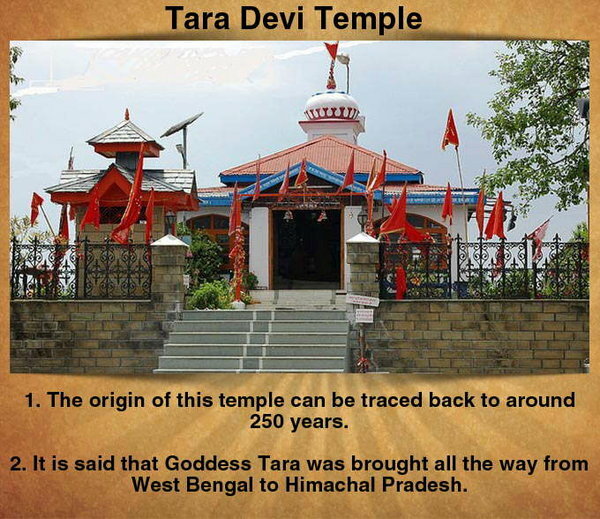 The temple was built approximately 250 years ago, Every year thousands of pilgrims visit Tara Devi temple. Himachal Pradesh also has two other most popular Hindu temples Chamunda Devi Temple and Jawala Ji temple. This important and famous Shakti Pitha is situated on a hilltop, at a distance of 30 Kms towards north of Brahmapur on the south bank of river Rushikulya in Odisha. The Shakti peeth is situated on the holy taratarini hill in the tribal state, Orissa. 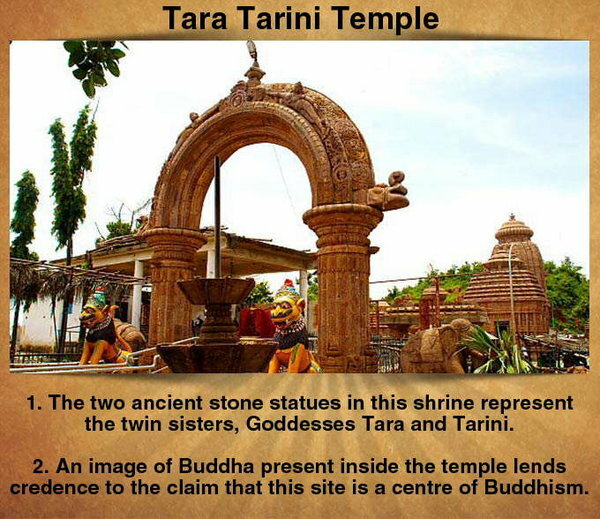 The Taratarini Temple is one of the most ancient shakti shrines of India,dedicated to the twin Goddesses Tara and Tarini worshiped as manifestations of Adi Shakti. The taratarini hill Shrine is one of the oldest pilgrimage centers of Mother Goddess and is one amongst the four major ancient Shakti Peethas in India. Kanaka Durga Temple is located in Vijayawada, Andhra Pradesh. 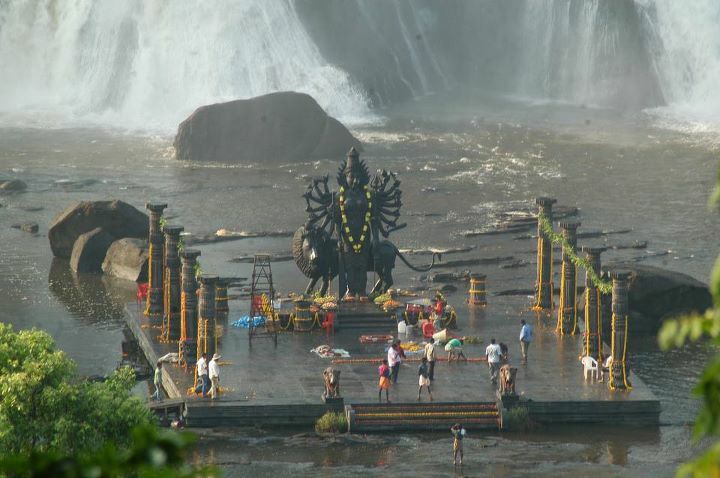 The temple is located on the Indrakeela hill, on the banks of Krishna River. The famous Hindu temple of Goddess Kanaka Durga lo- cated at Vijayawada in Andhra Pradesh. 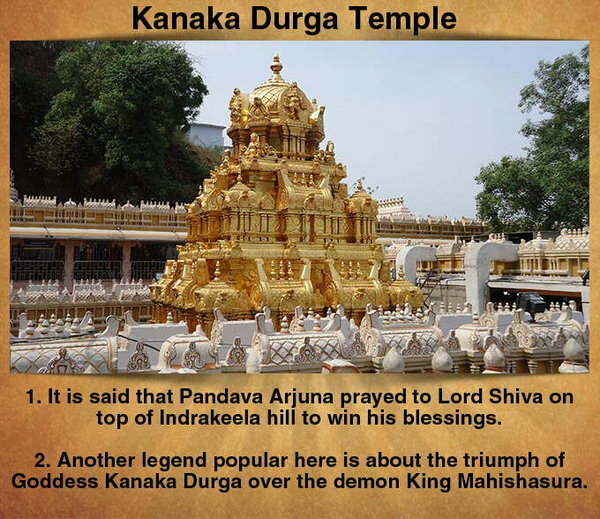 The Kanaka Durga Templeis dedic- ated to Goddess Kanak Durgeshwari, situated on a hill top of Indrakiladri mountain on the banks of river Krishna. It is one of the most important and second largest temple in Andhra Pradesh, Other temples are Tirupati Balaji Temple and Bhadrakali Temple. Mount Abu located in the Aravalli hills houses some of the most exquisite Jain temples. The huge shrine of Adhar Devi Temple bears a testimony to the rich architectural heritage of Rajasthan. 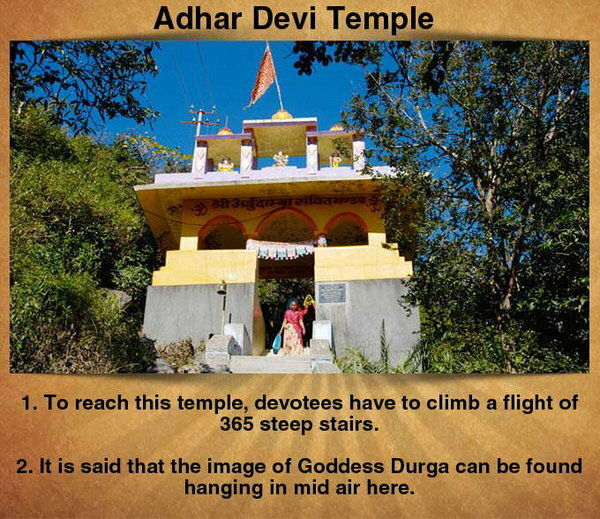 The Adhar Devi Temple is one of the popular religious destinations, Located in the Mount Abu region of Royal state Rajasthan. The temple is situated in a cave with picturesque views of the surrounding mountains and forests. 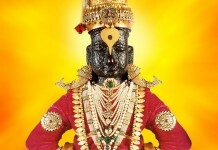 The Adhar Devi Temple is dedicated to the Goddess Durga, another world famous temple in Rajasthan is Karni Mata Temple. Bambleshwari Temple is situated at Dongargarh in Chhattisgarh. This temple is referred to as Badi Bambleshwari. 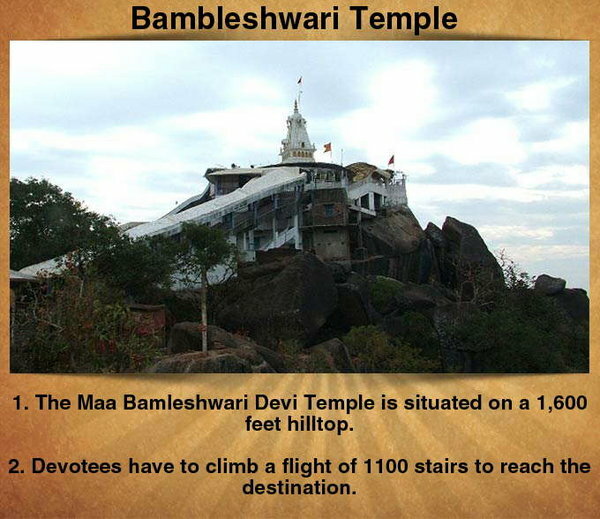 Maa Bamleshwari Temple is situated on a hilltop which is 1,600 ft high at Dongargarh in the state of Chhattisgarh. Dongargarh is one of the major tourist attraction as well as the main pilgrimage of the district and the prominent places of worship. The goddess Maa Bamleshwari temple refferd as Badi Bamleshwari, Another temple at ground level is situated about 1/2 km from the main temple is referred as Chhoti Bamleshwar. The tribal state also host one of the most famous temple called Danteshwari Temple. Saptashrungi is a site of Hindu pilgrimage situated 60 kilometres from Nashik in Maharashtra. According to the Hindu traditions, Goddess Saptashrungi wells within the seven mountain peaks. 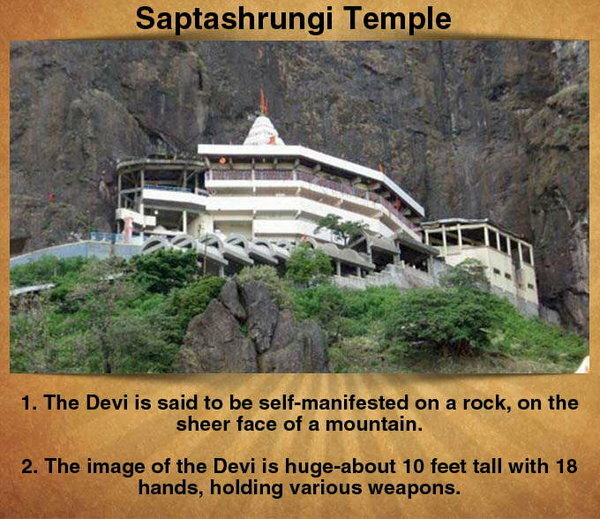 The Saptashrungi Devi temple is located at Vani near Nashik in Maharashtra. 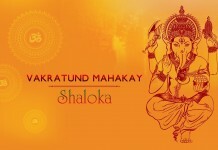 This temple is also one among the 51 Shakti peethas located on the Indian subcontinent. The image of the Devi is huge-about 10 feet tall with 18 hands, holding various weapons, A large number of devotees visit every year. Renuka/Anusuya Devi Temple, Ekvira Devi and Tulja Bhavani Temple are few famous temples of Goddess – Durga in Maharashtra. Located near Nehru Place in South Delhi, it is a very popular temple dedicated to the Goddess. It is a pretty old temple with the some portions dating back to 1764 A.D. The Kali Temple however had been built more than 300 years back. Legend says that even the Pandavs worshipped here. The uniqueness of the temple lies in the special evening tantric aarti.